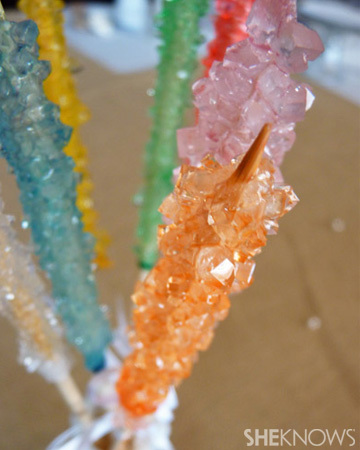 Do you remember the sugary, crystallized candy from your youth, also known as rock candy? With just three ingredients, you are on your way to making your very own version at home. Grab the kids, this recipe is part science experiment, part tasty treat. 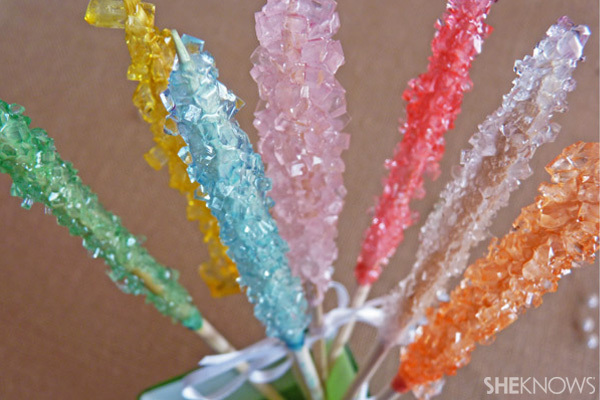 Whether you just want a fun summer activity, some homemade candy or perhaps you need favors for a wedding, party or event, this recipe for rock candy will fit the bill. With only a few ingredients, an easy preparation and a little patience, you’ll have your very own rock candy to enjoy regardless of the reason. Keep in mind that the results may vary just like any other experiment. Your crystals may be smaller or larger, may take longer to form or may not work at all. Luckily another batch is just a few minutes away. Keep trying until you perfect your technique. Bring water to boil and start adding sugar, one-quarter cup at a time, until it no longer dissolves. The more you add, the longer it will take to dissolve. Be patient and try to get as much to dissolve as possible. 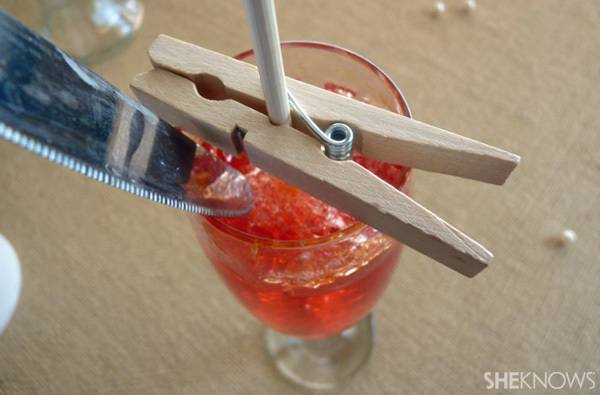 Clasp a skewer with a clothespin and dip it in the liquid and then dip it in plain sugar. 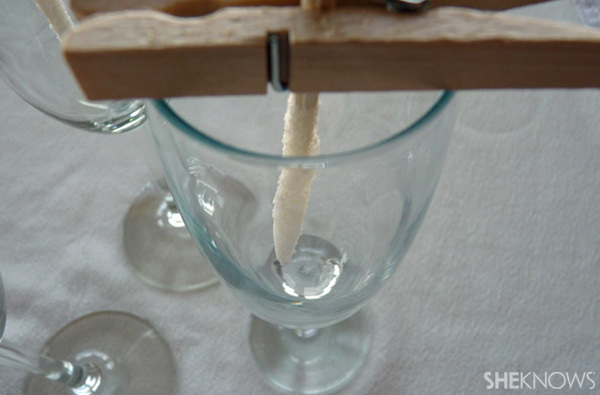 Place the stick in the Champagne flute to dry. Remove the liquid from heat and let cool completely. Fill the glasses with liquid. 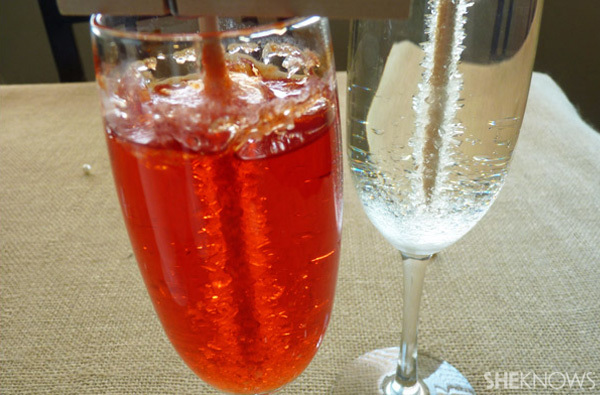 Using the recipe above, you’ll be able to fill two Champagne flutes. 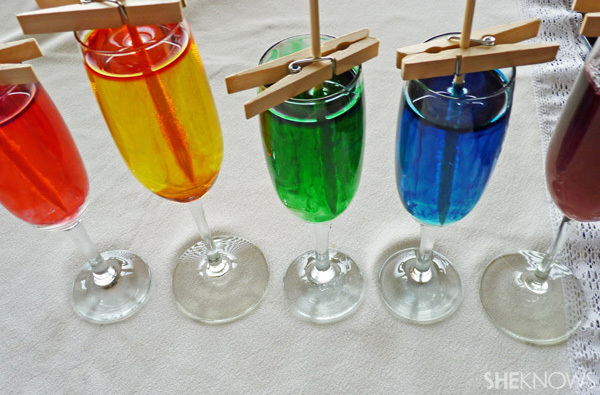 Add a few drops of food coloring to each glass. 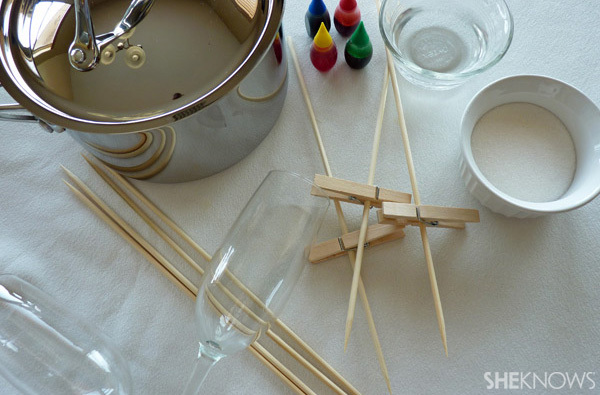 The more color you add, the more saturated the colors will be, and you’ll likely need more than you think.The skewer should be in the center of the glass and not touching the sides or bottom of the glass. Wait patiently. It will take about three days for crystals to form and about seven days to be large enough to enjoy. You’ll notice the sugar will start crystallizing on the top and bottom of the glass as well. You’ll be able to watch the progess as the crystals grow. Once it is dry, it’s ready to eat! Wrap them up in cellophane bags to serve at parties, use them as drink stirrers, or just eat them up! You can also add sprinkles while the candy is still wet for a festive look.